GIVE THANKS FOR THE BEAUTIFUL MUSIC! 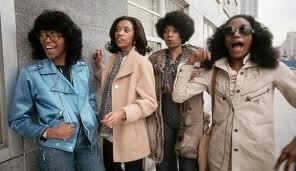 The Oakland, California, USA-born Pointer Sisters produced a bunch of classic music back in the early to mid-1970s. Their career lasted well into the new millennium but for now I focus on when they were a quartet: Ruth, Anita, Bonnie and June. By 1976 they became a trio when Bonnie left. The trio took a more contemporary and rock-influenced direction. Eventually only Anita and Ruth of the three singers billed as the Pointer Sisters were original members. The third singer was Issa, who was Ruth’s daughter, and for a New Year’s Eve gig, December 2010, in Singapore the third singer was Ruth’s granddaughter Sadako Ruth Johnson. Some argue that the Pointer Sisters fell off when they switched directions. Fans retort that they won more awards, sold more and amassed far more chart recordings as a trio. Rather than a fall off, there simply was greater success in a different direction. Many people may not understand how hard it is to stay at the top of the entertainment industry after four or five good years. These sisters have over three decades of success, and whether like their style or not, we ought to respect their achievements. This brings me to what I consider their classic work. The Pointer Sisters hit the scene with a signature hit, Allen Toussaint’s “Yes We Can.” While crate digging for material to sing, they came across a Lee Dorsey album that included the Toussaint produced and written song. And that was their modus operandi: search through their musical legacy and re-vamp the material while also producing fresh additions to the tradition. They were four willowy, black women with incredible harmony and a profound respect for black musical traditions. Additionally, they had the skill and the will to invest the material with a vim and vigor worthy of jazz soloists. Of course LH&R - Lambert, Hendricks and Ross, who pioneered vocal reproductions of modern jazz songs and solos - set the standard for this jazz choral singing. They were following in the tradition of the Mills Brothers. What was significant however, is that the Pointers were an all-female outfit who covered the waterfront rather than sticking up to cutesy, girlie type of arrangements and selections. The Pointer Sisters intelligently approached the broadest range of popular black vocal music. It is interesting that they did not record any overt gospel vocals even though, as the daughters of Sarah and Elder Elton Pointer, a minister at The West Oakland Church of God, the six Pointer siblings were brought up in the church tradition. Younger brothers Fritz and Aaron were the two siblings, and oddly, neither of them were interested in singing with their sisters. But then again, the Pointer household was very strict about music and anything other than religious music was forbidden. Ruth describes their upbringing as one big “no”— "No jewelry, no makeup, no dancing, no movies, and certainly no rock music. Daddy wanted to protect us from what he called ‘the devil’s work,’ and he worked hard to make sure he did." Typically, they rebelled against their strict upbringing and enthusiastically embraced secular forms of the music, mostly what they heard on the radio and in the homes of friends. Growing up literally in poverty, they spent most of their childhood entertaining themselves using the only instruments they could afford: their own voices. The Pointer Sisters blossomed into a trend-setting vocal group, who combined scatting with a wide range of black musical styles. Paradoxically, their first Grammy was awarded for a country and western song written by Anita with some finishing touches from Bonnie. "We got onstage to sing the song, and a guy from the audience stood up and said, ‘Well, hot damn, them gals is black!’ " Anita laughs. And despite being the toast of the town, that lack of visibility caused other problems in Opryland as well–ones not surprising to four young black women exploring unchartered terrain. "When we first performed at the Grand Ole Opry, the audiences loved us," Anita recalls. "But at the hotel where there was a party for us, the staff assumed we were the hired help and directed us toward the back door." Their retro-costumed stage presence complemented the range of their repertoire but also restricted their appeal among national (U.S) audiences. Ruth notes that their stage dress was an eclectic mix “from our mom’s friends, the garages, the attic, the thrift stores.” Detractors point to this as part of their proof that the sisters had identity issues. I believe, in fact, what we see with the Pointer Sisters are women embracing a wide swath of their ethnic heritage without limiting themselves to one style in order to fit into pre-conceived marketing notions of what will sell and what won’t sell. Yes, there is a big audience beyond jazz, blues and R&B, but at the same time there is no other music quite like the intense excitement generated by the core elements of secular black music—yes, gospel is equally exciting, however the well kept secret of gospel is that gospel is church music that has been influenced by jazz, blues and R&B. During their classic period, David Rubinson was the manager of the Pointer Sisters. Rubinson also managed Herbie Hancock. That’s Herbie and guitarist David “Wah Wah” Walker featured on “How Long (Betcha’ Got A Chick On The Side).” Both the sisters and Rubinson were serious about their jazz connections. Their live album offers the full range of their classic repertoire and is especially illustrative of their jazz improvisational side in the nine-minute feature song “Love In Them There Hills” , that utilizes a Brazilian flavor. They segue effortlessly from the funk of “Yes We Can”, using their voices as percussive instruments. By the end of their tenure with Rubinson, they were headed in a heavy R&B direction and thus the sound of the fifth and final album of classic material, the emphasis on newer material with a heavy back beat. The last song may sound like it has a Minnie Riperton flavor but it’s actually the greatest R&B composer of the last half of the twentieth century. And speaking of different flavors, don’t miss the collaboration composition (Isaac Hayes, June, Bonnie & Anita Pointer) “Easy Days.” Over and over our sisters evidence their ability to join with diverse elements of our heritage to produce wonderful music. Perhaps, we should note that producer David Rubinson was much more oriented toward black music traditions than was Richard Perry who switched the Pointer focus to rock and disco. Too often, what is produced is not simply (and almost never solely) whatever the artist chooses but rather what’s presented to (pushed on or marketed to) the public is usually whatever record company executives and producers think will work commercially. In terms of sales, Richard Perry was an excellent producer but in my book, popularity does not necessarily equate with classics. The tension between classic and commercial is the subtext of the entire history of recorded black music. Three decades plus of work by The Pointer Sisters perfectly encapsulates this paradox: the best music is often a comparative failure commercially. But rather than bemoaning or trash-talking about selling out, I think we should give thanks for what we have. Thank you Anita, Ruth, June and Bonnie Pointer for the beautiful music you gifted to us and to future generations of music lovers. Kalamu ya Salaam is a New Orleans-based writer and filmmaker. He is also the founder of Nommo Literary Society - a Black writers workshop. He blogs at Breath of Life.